Balls roll four rows of raceways precision-ground on a rail and a carriage, and end cap incorporated in the carriage allow the balls to circulate. Since the ball chain holds the balls, they do not fall off even if the rail is pulled out. 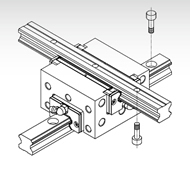 This model is an integral type of linear guideway that squares an internal structure similar to other model, which has a proven track record and is highly reliable, with another and uses two rails in combination. The two rails are also machined with high precision in relative straightness. As a result, extremely high accuracy in orthogonality is achieved. Since an orthogonal linear guideway system can be achieved with model SMH alone, a conventionally required saddle is no longer necessary, the structure for X-Y motion can be simplified and the whole system can be downsized.